The piecing together of this mosaic of musical life will never be entirely complete. Too many sources have perished over time. Yet the picture that emerges has several clear images. The great majority of medieval nuns participate fully in the daily singing of the monastic offices. They chant the Office of the Dead. They instruct younger nuns in the rudiments of singing and reading. They participate in the act of pilgrimage through processionals around the church and cloister and occasionally into the community. 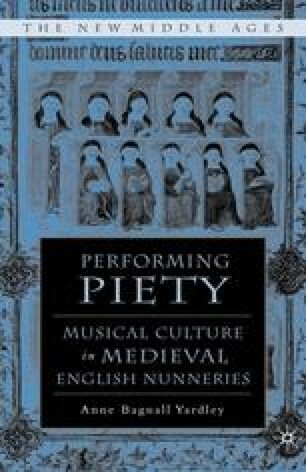 Indeed such bright spots in the mosaic as Barking Abbey suggest that in many nunneries the creativity of individual nun musicians found ample scope in the creation of chants for local feasts and the development of liturgical drama.